The Centre for Excellence in Learning and Teaching at An-Najah hosted a training workshop on using online tools to assess lower and higher order skills in 1st year large enrolment classes. The workshop facilitators discussed the prepared online assessment options from Calculus and Biology. Fifteen participants from Science, Medical Science, Law School, Media, Fine Arts, Humanities and Engineering participated in the workshop. The workshop focused on discussing alternative assessment options for 1st year education by incorporating self-learning activities which target higher as well as lower order skills. 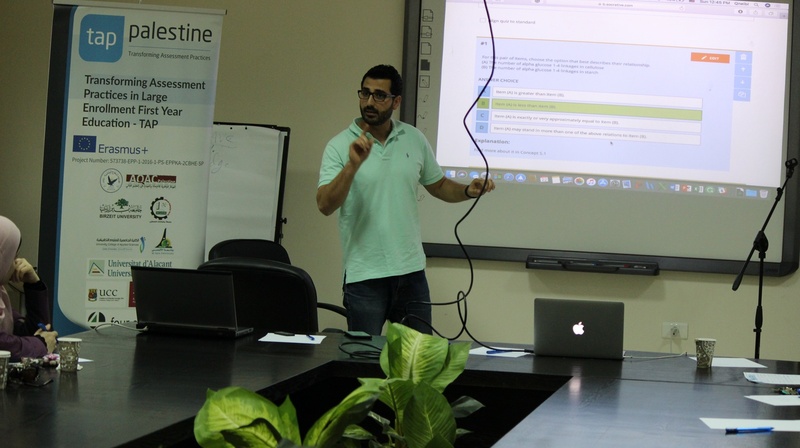 The speakers presented the Socrative and Padlet tools in addition to the Moodle course designs. The workshop will be followed by another one in which the participants will practice hands-on these online tools and the functions for the designed activities.